Inspiration, Doing Something You Hate, and Falling in Love Again. The first time I was asked to paint an abstract painting, I hated it. It was an autumn day during my second fall semester at Pitt, exactly 10 years ago. I was taking a Painting 101 course to go towards my Studio Arts minor and the class was largely assessment-based. It would be my first time using oil paints, and while I loved painting the glass bottles, still-lifes of fruit, and my favorite--people--I hated abstract painting. Everything about the concept of painting abstractly annoyed me. Whyyyyy would anyone take a look at all the beauty on earth and distort it? Why not capture it as precisely as you can? That's what I used to think. Lucky for me, our professor only expected us to complete one abstract assignment and graciously graded us according to our efforts, not our finished product. I managed to get an A in that class but my abstract painting almost got in the way of that. The instructor told us to go out and find some inspiration, bring back some elements from nature for us to abstract. Naturally, on a fall day in Pittsburgh, Pennsylvania, I grabbed some beautifully colored leaves and proceeded to make a terrible painting. So terrible that I don't even have a picture to show you. I quickly put the painting and that assignment aside and out of my memory. "Dear God, never let me have to do that again" I thought. 10 years later, I eat my words because it's the only type of paintings I want to create these days. Maybe I wasn't developed enough yet as an artist. I was 18. A baby by many standards. And surely, even though I had been drawing and painting since childhood, I didn't have a true vision for the type of work that I wanted to add to the world. These two pieces can be considered prototypes for future work. I love the texture and flair in each of them. I didn't even realize that they match until today when I photographed them. And both of them hold some secrets because it was the very first time I introduced spray paint into my fine art practice. I hope to convert them into patterns for textiles. I can even see them both on a lovely scarf. But it all started with a few leaves. It all started with looking again. I share these paintings with you today and invite you to look again at the familiar. You just might get inspired. P.S. Would you be interested in taking a workshop with me? If so, please click here and leave your details so you'll be the first to know about upcoming classes. Can you make art while you're sad? In my attempts to practice what I preach, I want to open up today about a very unpopular topic but something that has shaped my experiences and how I move through life greatly. I had a creative consultation with an artist today. And as usual, we started with her story, her "why". When she opened up about some pretty scary things and how it put life in perspective, causing her to follow her dream of becoming a full-time artist, I stopped and scribbled down some notes. I then told her that she needed to share this. That the level of detail was up to her, but the story was as interesting as the art itself and it needed to be told. It needs to be a part of narrative, and in the process, I realize I haven't really been up front about my own. I told her that my ongoing struggles with low-level depression led me to commit to a regular art practice and that even though my art is happy and up-beat, it's really a response to my own self-work to not be sad, and to live in the present moment. As the words flew out of my mouth, I knew I had to rethink my own platform, and consider how my posts and "branding" for lack of a better word, could be a bit problematic. I'd never want someone to go to my IG feed and assume that my life was perfect, or that I was having the time of my life all of the time (although many days I am jumping for joy at the fact that I get to live out my childhood dream of being an artist). It wouldn't make me feel good as I have a disdain for people putting me on any kind of pedestal. I don't like being the center of attention in public or social settings, and I still don't know how to take a compliment properly, although I've learned to be more gracious in the past few years. That confidence grew as I began to come into my own as an artist and boss, realizing the gift to touch lives with my creativity. But I still battle with my inner demons. Like my art, happiness is a daily practice. And depression is something I've learned to accept as just part of the way I was wired. It took a long time for me to accept or even acknowledge because I thought it was just my personality. At least it came with a dark sense of humor, right? In Abu Dhabi, I reached a real low after just 6 months as I found myself in a new country, no familial support, and facing very scary health prospects in my family life. I was terrified and not fun to be around. By the end of the year, I had to seek help. Adjust my outlook on a few things. And dive head first into the one thing I could control. My art. The hard work paid off, and the clouds began to lift again. But then came the anxiety. In a land where everyone's trying to be the next big mogul, and anything's possible, living the Dubai/Abu Dhabi dream bought out my anxiety like nothing else. I would look out of my window, 30 stories high off the ground and stare into a 100-degree abyss of opportunity. I was startled with the idea of sitting still. Disgusted with the possibility of leaving this country without leaving my mark, without doing anything other than shopping--and in the UAE, shopping in the most breathtaking malls year after year can keep you quite busy. It wasn't enough. (Insert: I wasn't enough). I was able to shake much of my depression off. I'd feel it coming and I'd do things to lift my spirits. Mostly create art, listen to podcasts, etc. But like an old friend, it was still waiting by the phone for that familiar conversation of loneliness, self-loathing, and pessimism. I soothed its wait with accomplishments. More art sales. More shows. More press. Pushing past new limits of health and balance. Anything to leave it in the dust. I even thought that so much of my anxiety was because of that dusty metropolis itself. Moving back home seemed like the right solution. And then the politics happened. And the horrifying news flashing across our screens happened. And the bigotry happened. One day my younger sister in her headscarf was stared and laughed at for the course of a family meal at a local restaurant. And it hurt me to the core. And then #BlackLivesMatter happened. I couldn't hear one more reminder that racism in America is still an issue in 2016. That the way I look causes people to fear me. Or my kin. It ripped me apart. And like a true loyal friend, Depression came to visit. Getting out of the bed felt pointless. Suddenly, I couldn't deal. So many external forces aggravated my already frantic state and we met again, instantly. My old friend. Hello, Depression. I thought I saw you around the corner and here we are again. The difference is that now I can recognize a little more easily that I am not my emotions. I am not my fears and my anxieties. I am not my pain. We all have painful things in our lives that we must deal with. I don't think for a second that trading our lives with people we see online or on TV, or in our PTA meetings, or even in our families is the solution, because no one goes through life unscathed. I know it took me forever to answer this question, but yes. You can make art while you're sad. While you're depressed. While you're hurting for the world. While you're exhausted with a difficult medical situation. While you're barely hanging for dear life. You can make art while you're sad. These days I'm taking active measures to live a more holistic life. Two weeks ago I deactivated my personal Facebook account (you can still find me on Instagram and my Facebook business page) and unplugged from my favorite social media platform, Snapchat. Mostly because I wanted to take back my personal space and refresh. I'm spending in time in nature, going on hikes; today I meditated in the gorgeous Verona Park. Family is a nice buffer because, well, let's be honest, they're crazy and keep me out of my own head. But, they also require more of my time which means that, even if I wanted to live like the workhorse that I was in UAE, I couldn't. Work-life balance is suddenly a thing again. There's more time in between the original art I list for sale. So I expanded my print collection while I get settled into a new studio here in the States. I will also be raising my prices in a few months to reflect the growth in my life and the value I see in what I do. We can make art when we're sad, but let's not. Seek the help that you need professionally, medically, spiritually, and safely. Don't suffer alone and indefinitely. But keep moving. Keep making anyway. I hope that we don't have to stay in that space, and I truly hope we all can find more joy and happiness in the world. I just had to come clean about my own struggles. Yes, to happy art anyway. Disclaimer: This is my personal blog documenting my own experiences. The information on this site is not intended or implied to be a substitute for professional medical advice, diagnosis or treatment. Enjoyed this post? Subscribe to my newsletter for more personal letters and regular updates. I know, I know... I'm an artist, right? I'm not supposed to say that. I get asked from time to time: "What inspired this piece?" and I'm supposed to come up with a great intellectual explanation. I've attended workshops and art seminars on storytelling, and artists are rightfully advised to sell our work always with "the story" behind it. Be it fact or fiction, we must relay some sequence of events, preferably starting with obscurity to sudden clarity, as if that can somehow give rhyme or reason to a finished painting. Can I be completely honest with you? I'm not really fond of the question. Not because I lack inspiration, but because my art practice is not a linear one. I paint in cycles. Often working on several canvases at once. Some end up in the proverbial trash bin, and others make it to the other side. And guess what? I have no idea which pieces will be the successful ones. And that inspiration, man, when you find it, you'll know. It's like love. And just like love, if there's anyone out there trying to give you a roadmap or formula, know that they're drinking their own Kool-Aid or straight up just making this stuff up. I reject the notion of a singular idea leading to a singular painting. That some genius idea grabs hold of us and doesn't let us rest until we execute it to completion, and then we are out of work until the next big idea strikes. So in the spirit of showing up and getting to work, I wanted to leave with 5 ways to consistently cultivate your creativity so that you'll be equipped the next time you find yourself slipping into artist block. Cultivate your creativity in your process. Painting is one big playground. Give yourself permission to get out of your own way, relinquish control, and just go for it. I'll be the first to admit, painting a lot of times is just experimentation. When I'm painting, my subconscious chatter probably sounds like: "I wonder what would happen if I place this color here, or scratch out this layer, or add in this texture?" So many times, I am just so inspired by the process itself. I'll have a song stuck in my head, or a line repeating from a book I'm reading, or I'll be in the flow and random memories will just pop up into my consciousness. And then, BOOM! There's the title for my next piece. There's the feeling I'll want to convey, or the end result starts to form and I'll know what to edit out and what to take up a notch. I guess what I'm trying to say is, painting is fun. And I don't have to have a reason to do it every time. Sometimes, just being with my paints on a white surface, a good cup of coffee, on a sunny studio floor is all the inspiration necessary. Cultivate your creativity in your hopes and dreams. In speaking of inspiration, another misconception is that the way a painting looks is how the artist was feeling at the time. Gosh, wouldn't that be convenient? If, happy paintings came from happy people. I deliberately use happy colors in my work and people often assume, "Oh you're so happy to create work like that." This couldn't be more further from the truth. I've created some of my cheerful happiest paintings when I was depressed. Not always, but the two do not depend on each other. And what a relief it is to know that my work doesn't have to depend on my emotional state. I can tell you that if it did, my body of work would be all over the place because that is the human experience. We're not consistent. But I believe our deepest, core desires are. We all want to feel joy. We all want to be connected to the world around us. We all want to be loved. And so we can let that define our work, continuously and always about: love, connection, humanity. You don't have to paint what you feel, but you can use the process of painting to be a healing one, and arrive at a piece of art that will lift your spirits by the time your finished. And that, in my opinion, is the most empowering thing about being an artist. Taking refuge in Bali. April 2016. Cultivate your creativity in the rest. It seems counterintuitive, but pulling back and allowing yourself to live outside of the studio is very important. Go out. Travel. Spend time with family. Spend time with yourself. Watch a season of something ridiculous. Chill. It may not give light to a new idea, and that's okay. You might run into Stephen Colbert at your local Whole Foods instead. I've learned that creativity is a muscle, and while challenges like painting 30 in 30 days and showing up regularly can definitely build your endurance, you can overwork it. Rest from being so damn inspired. Rest from art. And searching. And feeling so fricking much. Because, man, are we a sensitive bunch. Cultivate your creativity through your previous work. This is super key. In fact, this should probably have been #1, but here we are. As an aspiring artist, in the beginning you're trying to find your style and your voice. And naturally, so much of that is looking externally. But a key turning point in your art practice begins the moment when you start to look inwardly. Truly inward. Your work starts to speak to each other. Especially if you're painting on multiple canvases at once (highly recommend), one painting informs the next. This is when you're truly independent as an artist. And the freedom that you feel in that moment, even if just for a day, is one of the best feelings in the world. You're feverish with ideas. And you can't paint fast enough because you're just so into your own journey. You don't have time to second-guess yourself. You're too busy painting your heart out. This is a controversial, one. But yes, cultivate your creativity via your peers. 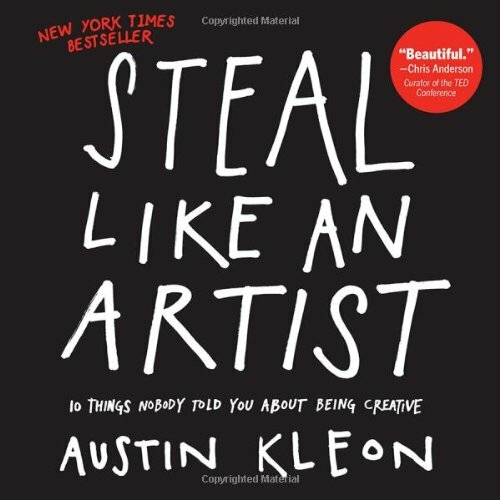 I love Austin Kleon's book "Steal Like an Artist". I highly recommend you read it, but in the meantime, allow me to digress for a bit. My background is in Sociology. Fun fact, as an undergrad, I completed an honors thesis (literature review, data collection, worked on it for 3 years, and all that, y'all). I thought I wanted to get a Ph.D. and I still indeed love social research. But anyway, much of my training still affects how I think today. One idea that sticks is this concept of a "unique contribution". Every thesis candidate and research student knows this. Essentially, it's the idea of synthesizing all of the existing work out there, weeding through the noise, and deciding what's missing. What can be remixed or reworked for the greater good. And so for that reason, I recommend looking at other art, especially in the beginning and look to not only what catches your eye, but the gaps, and what you think you could do better. That's where you can find your place. And that's how you steal like an artist. This was a very long blog post. But I guess the simple message is this: If you're like me, you're probably still learning and enjoying every minute of it. You don't have time for lofty ideas about art. You've got nothing to prove but the work itself. Let the art stand on its own. And if people connect with it, it will be instant. And if not, that's fine. You'll move on to something else that lights you up inside. Because that's the thing, when it's real, you don't need an explanation. You feel it. That's inspiration. That's the je ne sais quoi, and no one owns it. Not even me. What are your thoughts on inspiration and how do you cultivate creativity in your day to day life? Share more tips below! These last few weeks have been somewhat peculiar for me. If you follow me on Instagram or Facebook, you know that I paint. And, I paint a lot. I share a lot of that, too. And I'm blessed in that social media has been a crucial part in how I think I've been able to grow my art business and grow as an artist in such a short amount of time. I believe the magic happens in the work and doing lots of it and I'm happy to share my journey as I go along. We launched our #ArtForSyria page for the month of October to raise money for Syrian refugee families. Reviewing contracts and getting things in place to see my art in more corners of the world. Yay! Organizing all the bazillion painting files on my computer onto a very unsexy terabyte hard drive. Back, back, back back back it up! And catching the sunrise occasionally with a warm cup of coffee in my hand and my love by my side. It was a much needed pause, but like any creative, I'm starting to feel that itch in my hands, the anxiety in my steps, and a certain coyness about going to face my quiet studio after not being in the zone for far too long. I have a large abstract commission on my calendar, so that will keep me busy into the holiday season and push me to get back in the swing of things. But even more than a deadline is the feeling of knowing that I'm just not truly myself when I'm not creating. I think too much. I spend time doing things that don't fuel me. I truly believe that I'm a better friend, a better partner, and a better person when I'm doing what I love on a regular basis. And so I am happy to cut out the crap, declutter my life and bring on the next series of paint flinging, stereo booming, pajama dancing sessions in the studio. Recently, I've been doing some work internally and also decided to let go of my oh-so-seductive love of Periscope. You may have heard of the latest app giving you the ability to broadcast live anywhere in the world with the tap of your smartphone. And yes, I have found tremendous value in the few short months that I've been on it. I hope I've provided value as well to the people kind enough to hang out with me. I've graced my face, my art, and my home more times than expected with the hopes of sharing and connecting with people that I may have otherwise wouldn't have been able to find. Problem is, it's just not me. It's not who I am. I'm not a performer. I don't walk into a room of crowded people and feel a buzz. I feel a pit in my stomach and I start to look for a familiar face to connect with instantly. One of the benefits of taking time to work on yourself, as well as invest in the support you may need to help you do that (thank you, coaches out there), is that it provides you with the ability to listen to your small voice. The one that you can hear at 1am, when the curtains have been drawn, when you're friends to no one but your own thoughts. You can hear it then. In a world of constant change and development, it's hard not to fall victim to the "shiny object syndrome". I know that for me, personally, I love social media because I love sharing and and I love connecting. It's one of the reasons why you can find me on Snapchat, Pinterest, Medium, Tumblr, you name it. But at the same time, I can control the level of intimacy and frequency of that connection as I see fit. And I can't tell you how relieved I felt when I deleted the app from my iPhone. I look forward to engaging in the workshops and small artist sessions I host occasionally here in Abu Dhabi, and in the meantime, I can focus on what's most important for me as an artist: the art. I hate the sense of overwhelm that can come up when you say yes to everything. Sometimes you do things without even realizing that you're subconsciously saying yes. Yesterday, I was listening to one of my favorite podcasts "Being Boss" and on an episode with Paul Jarvis, he said how at first, he says no to everything. It seems like a bullish thing to do, but after listening to his explanation it was genius. When you're focused on your work and serving your rat people (aka tribe), most things that pop up are truly a distraction. By saying no initially, you get avoid spreading yourself to thin. Besides, how many coaches and savvy mavericks do I need to meet in a day? Everyone's got something to say, but what I've found is that I speak best with a brush in my hand and the canvas as my stage. As promised, here are some photos of the new bits and pieces in my flat. This pendant light captured me right away. I love the bamboo design and adds a bit of warmth to the home. Having an official desk has been awesome! This is where I answer emails, engage, and brainstorm. My favorite little splurge has been getting a console table. I can store my magazines neatly, it has a beautiful clean design, and provides a nice structure to a painting or large mirror, depending on the day. Short of fresh flowers, but I've been craving yellow so substituted with a bowl of fresh lemons. 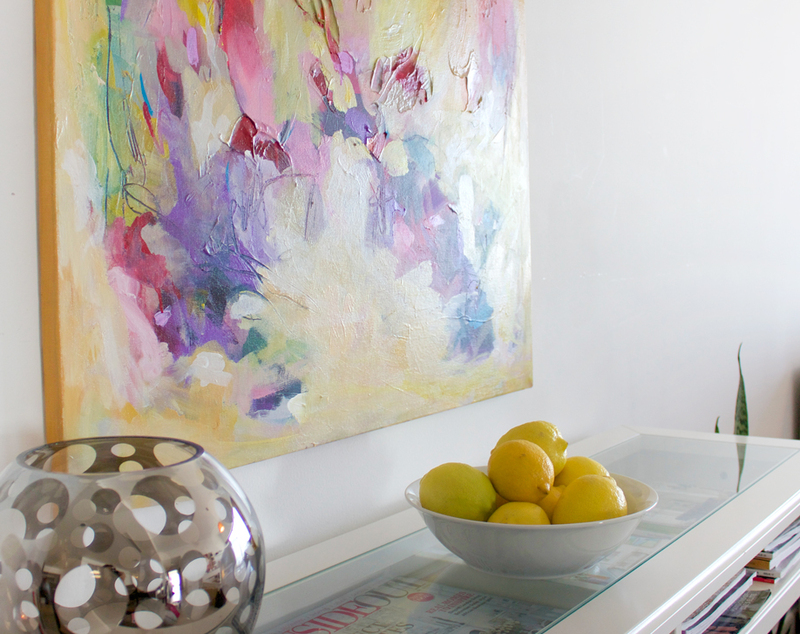 How do you add color to your home? What have you been cutting out of your life to make the daily grind more dreamy? In the midst of the craziness going on these last few weeks, I thought I'd pause for a minute to write about what my world is looking like. It's the middle of the month, almost the middle of the year, and it's a Tuesday. That's hump day for us in Abu Dhabi. So all across the board, I'm in the thick of it. I decided to share some thoughts on what it's like behind the scenes as of late. Since I got back to Abu Dhabi, however, it's been fast paced with a lot of moving parts all with the hopes of things working out later down the road. I've been working harder than ever, but I wouldn't do it if it wasn't my passion. And as a result, I have had to take some important steps to maintain the longevity of my career. Namely, getting my work professionally photographed by a reputable art photography company. I also had to get some professional photos of myself taken for some publication possibilities. My website got a big makeover and is still in the development phase. I've also been working closely with a designer who is helping me get a better visual handle on myself as an artist and maker. And last but not least, I've been painting up and down for weeks for two special projects (in addition to my growing population of the #amirarahimsafari). I can't divulge many details as of now, but I can say that it is for pretty high end clients and it is certainly requiring a lot out of me physically and creatively. Surprisingly, I can actually multi-task projects. I can work across the board on 2-3 different creative endeavors in one day, in the span of a few hours. This really helps with efficiency, or it can help you go mad, depending on how your brain works, ha. But for now, I'm able to flip switches, start paintings, and work on multiple canvases at once without getting confused. I have NOT neglected myself or my health. I can squeeze in a quick session at the gym a few times a week. Since I prefer to start painting at sunrise, I don't have to stay up late at night either and throw off my body's internal clock. This is great, and also means I am keeping anxiety at bay, which is never nice at any time in life. I do not have to neglect my house and personal life. I can cook a healthy meal and keep up with gist or the illusion of an orderly home. I can also meet with friends for a few hours or enjoy my favorite show on the couch with my guy. I've also squeezed in a few reiki energy sessions to keep my chakras in balance and hopefully my spiritual side as well. I have not hit a creative block and can keep generating ideas as I continue to work. This is huge. Something I'm obviously very grateful for at the moment because, let me just tell you, there's nothing more frustrating than having to paint and feeling fresh out of inspiration or motivation. This is usually a sign that you need to take a break, and while I am approaching this point, it hasn't stopped the creative flow. I can evaluate propositions and determine if it is of benefit to me. Recently, I was faced with the dilemma of selling the rights to artwork I had created to an interested party for the use of their business. There's a whole load of opinions and articles out there on art licensing and how to navigate the space. Fortunately, I have been doing my own reading on the matter for a while now so wasn't completely bamboozled when the topic came up. There are still lots of details and terms to hash out, but bottom line, I'm up for the challenge of figuring it out. Even if we agree to part ways at the end, I'm not afraid to at least learn more. I can take risks in my work and try out new ideas. This has been really fun. I've been using new materials and experimenting with different imagery and color palettes to give life to my new body of work. I don't ever want to get stuck in a routine in my art making. I think the work that really resonates with people is often the piece that I stumbled upon through my own exploratory period and fascination. Maintaining that level of spontaneity in a series is of course, very difficult, but a worth goal in my opinion. And that's really all there is to it. I'm juggling a lot, but I can't complain. I'm busy, but good busy. Stressed, but good stressed if there's such a thing. Today, I also just launched my new print collection, and hope that people will enjoy these affordable offerings. So yes, there's so much more to being an artist or painter than sitting at the easel and painting. I love reading about other artists' journeys, so I hope what I shared was an interesting nugget about the daily grind. And how do you recharge when you're reallllllly busy?